Satisfy your inner culture vulture at Saint Tryphon Pechenga Orthodox Church and Gold Prospector Museum. You'll explore the less-touristy side of things at Action Park and Hippupuoti Gift Shop. Step out of Saariselka to go to Inari and see Pielpajarvi Wilderness Church, which is approximately 1h 10 min away. 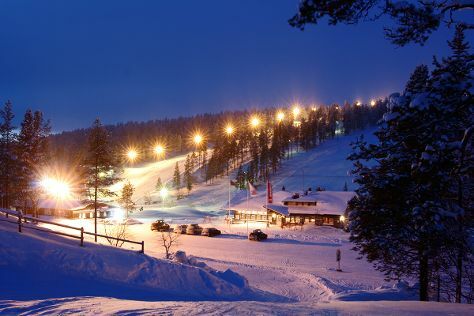 On the 25th (Wed), spend an exhilarating day on the slopes at Saariselka Ski & Sport Resort. To see maps, where to stay, more things to do, and more tourist information, read Saariselka online journey planner . New York City, USA to Saariselka is an approximately 24-hour flight. The time zone difference when traveling from New York City to Saariselka is 7 hours. Traveling from New York City in December, expect Saariselka to be colder, temps between 21°F and 6°F. Finish your sightseeing early on the 26th (Thu) to allow enough time to travel back home.